Fans of tag professional wrestling, heave a sigh of relief. World Wrestling Entertainment's Booker T says the sports entertainment genre which helped make him one of the most decorated grapplers in history is ready for a comeback! Now can ya dig that, sucka?!? Nobody's a bigger fan of tag team wrestling than Booker T. Before becoming a solo superstar and multiple-time World Heavyweight champion, the Houston native was half of one of the most accomplished teams in history. Though it's been a lost art in recent years, the Hall of Famer foresees a resurgence in tag team wrestling -- and suggests younger wrestlers consider its benefits to a lasting ring career. 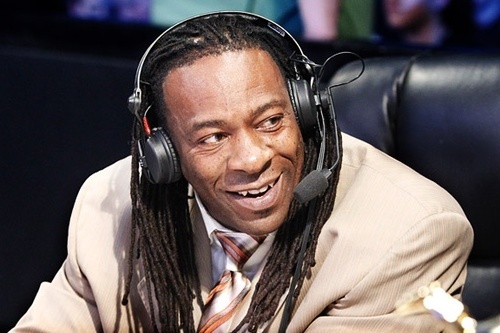 "I worked in a tag team for ten years, then I started doing singles wrestling and became a whole new person," shared Booker T during a recent in-person interview, "My career lasted 20-plus years. It's really a great stepping-stone to get in the business as a tag team." 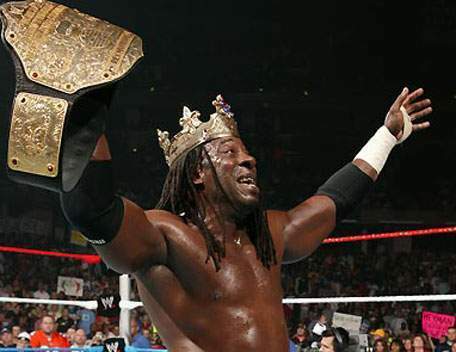 Prior to becoming a five-time, five-time, five-time World Heavyweight champion -- an achievement he turned into a veritable catchphrase -- and one-time WWE Champ, Booker T and brother Stevie Ray ran roughshod through World Championship Wrestling. As Harlem Heat, they wore tag team gold a record ten times. "Normally, tag teams are guys who are groomed together from the beginning; those are great tag teams," reflected Booker T during a recent press event promoting WrestleMania 31, coming March 29 to the new Levi's Stadium in Santa Clara, CA. Of course, Booker entered professional wrestling at a very different time -- an era which celebrated its tag team division. Name-checking iconic pairings like The Road Warriors, The Rock 'n Roll Express, The Midnight Express and The Nasty Boys -- all multiple-time World Tag Team Champions in numerous companies -- he said each was comprised of individuals dedicated to successful partnerships. "All those teams were together from the beginning," noted the WWE's one-time "King of the Ring." "I think that's the thing young guys really need to understand. Maybe starting out in a tag team could benefit you a whole lot more, like it did myself." In recent years, professional wrestling (particularly the WWE) has downplayed the tag division, Booker acknowledged. Rather than focusing on teams, and encouraging young performers to come through the ranks as half of a duo, tag wrestling has been used as a means of promoting make-shift pairings like Chris Jericho and The Big Show, John Cena and The Miz, Kane and Daniel Brian and even, at one time, Booker T and Goldust. "It just doesn't work like that...It has for the last ten or 15 years, but before that, it wasn't like that," he said of partnering solo superstars, "Normally, a tag team you put together, they just don't last -- as has been proven over the years." The tides are beginning to change though, Booker T opined. Citing an influx of new teams including recent champs Gold and Star Dust ("Two brothers teaming up," he said), Luke Harper and Eric Rowan -- who until their falling out and turn to singles action teamed as The Wyatt Family -- and siblings Jimmy and Jey Uso, he suggested the division finally has "a little wind behind it" again. "The Usos, I think, gives tag team wrestling a chance to have a rebirth," stated Booker, now an on-air personality and commentator for WWE, "Now we just need to get a few more guys on the same page." He looks to the WWE's Florida-based NXT development territory as a breeding ground for stars of the future. Like many fans, Booker T looks forward to seeing former NXT Tag Team champs The Ascension called to the main roster. "They've got a really hot buzz behind them right now," he said of the duo, the longest-reigning tag champs in NXT's history. "They'll fit right into the mix in the WWE tag team division. Hopefully they can create a few more [teams] down there too."